This is the perfect sea front getaway! Enjoy a wonderful fire in the fireplace while see sea into our cove. Whether for a romantic escape, a family vacation or a small group of friends, this is the place! We welcome your children. The House has a big patio and terrace for that sunset glass of wine. The town of Sant'Antioco is 10 minutes away with restaurants, groceries, coffee house, and wineries and quaint shops. The area is known for its natural beauty, exquisite coastline, abundant wildlife, copious sea life, bounteous wildflowers and extensive olivewoods. COME RELAX… in this cozy seafront home which features a 3 bed rooms and 2 bathrooms . The living area offers inviting seating and dining, LCD HD TV. The dining area opens to the sea facing deck which includes an wood barbecue, comfortable seating, …where better to sip a Carignano wine, watch the sea or enjoy the milky way, and the sounds of the ocean to lull you to sleep. The kitchen is completely furnished and features all new appliances. Additionally the home is nestled on two sides by 1,5 acres of dedicated open space preserve for additional privacy, wildlife viewing and tranquility. Expansive windows, warm and decorative lighting, new furniture, will contribute to making your stay enjoyable and memorable. "The house was super; clean, spacious and well equipped. The gardens were beautiful and the setting beautiful. We had a fantastic stay." 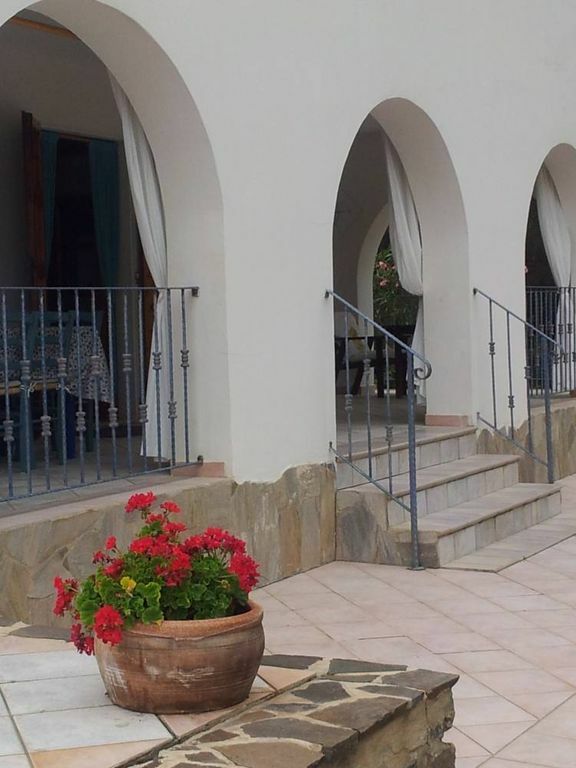 "Lovely villa in a beautiful, private setting. Spacious rooms and a fantastic living area. Excellent kitchen which is well equiped and owners kindly leave a welcoming food parcel. Be aware that running water is salty so good supply of bottled water is recommended. Easy driving access to town for provisions. Own vehicle is essential. Highly recommended for a relaxing, quiet holiday.". la casa è approvvigionata nei due bagni da un pozzo artesiano, l'acqua è salmastra, come hanno giustamente rilevato, ma nella cucina ci sono due linee idriche: una per il lavaggio delle stoviglie, di acqua salmastra, l'altra , di acqua dolce e potabile, per gli usi alimentari e anche lavaggio stoviglie. La riserva è abbondantissima, sono circa 30.000 litri di acqua dolce che viene rifornita ad ogni inquilino. L'altra acqua, quella salmastra, è illimitata. The house is supplied by two water lines: one is slighty salty as it is well water (used for washing), the other line is for drinking water. The renters possibly used the wrong line for drinking water and hence considered the water too salty to drink. I can confirm that the other line contains water which is perfectly suitable for drinking. Positiv: echte Alleinlage auf riesigem Grundstück mit Meerblick und Meerzugang, der jedoch nicht wie im Inserat "privat" sondern öffentlich ist. Negativ: Häuser in dieser Größe und Preis verfügen üblicherweise in diesen Breitengraden über eine Klimaanlage, leider keine vorhanden = 1 Stern Abzug. Die Fotos im Inserat müssen teilweise über 30 Jahre alt sein. Der Sandstrand existiert in dieser Form nicht mehr, ob durch den angehobenen Meeresspiegel oder die Erosion, es ist nur mehr ein steiniger Küstenstreifen vorhanden, Sand nur mehr unter dem Meeresspiegel, jedenfalls zum "Sandspielen" für Kleinkinder nicht geeignet! Dies führt zum Abzug eines weiteren Sternes, da falsche Tatsachen durch die Fotos suggeriert werden. Tra le dotazioni della casa non è presente l'aria condizionata . Voi avete scelto la casa consapevoli di questo, non potete adesso indicarlo come un punto negativo. Sapevate già prima dell'arrivo che non c'era . Gli accessi al mare sono privati , ma nessuna spiaggia può essere esclusiva in Italia , né privata . Le foto sono recentissime , ma non è colpa nostra se le mareggiate a volte erodono le spiagge lasciando a nudo i ciottoli . E' la prima volta che riceviamo una recensione negativa . Forse siete voi troppo critici , troppo esigenti. Dovete scegliere con maggiore attenzione l'alloggio per le vostre vacanze, e se volete l'aria condizionata scegliete una casa con l'aria condizionata , senza lamentarvi ( dopo ) che non c'è . Casa immersa nel verde, ad un passo dal mare in una zona fantastica, tutte le descrizioni sulla casa corrispondono alla verità, nessun problema di nessun tipo, proprietari disponibili per ogni cosa, assolutamente da ripetere. "Une maison tres agréable dans un environ magnifique. Le nouveau "spiaggio" au bord du grand jardin, était une surprise pour nous. C''était la 2ème fois et nou reviendrons. Rien Meta Janny et Albert. Pays Bas." "Très belle maison dans un cadre sauvage près de plusieurs criques et plages accessibles à pied. Le terrain est vaste (on y voit parfois quelques petits lapins s''y promener). La vue est très belle sur la mer et la tour. La maison est idéale pour une famille avec des enfants (un grand bac à sable se trouve à côté de la terrasse). L''accueil de Valeria et Carla est très chaleureux. Je conseille vivement cette location aux personnes souhaitant être dans un cadre paisible au milieu de la nature et près de la mer." Rich island of historical-archaeological testimonies of Phoenicians and roman period . Absolutely to visit the paleo - Christian Basilica with immense catacombs Christian, and the ancient village ipogeo, gained from one portion of necropolis Phoenicians, inhabited until the 1953, only one in Sardinia.